English Sterling Silver Monteith Style Bowl With Lion Mask Handles. 9″ Diameter x 7.75″ High. 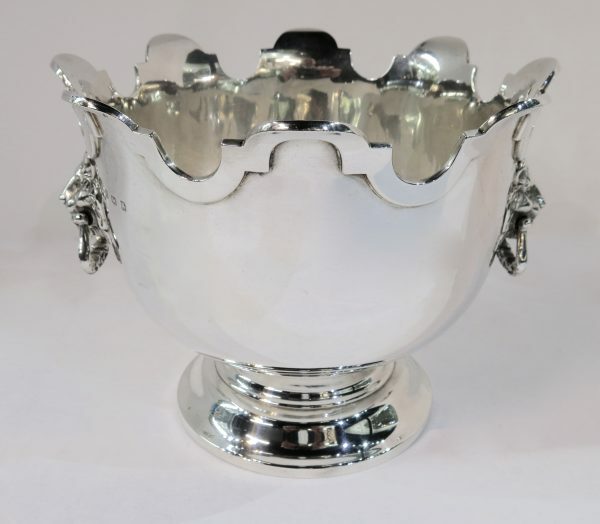 English, Sterling Silver Monteith Bowl With Lion Mask Mounted Swing Handles. Made By Adie Brothers, Dated 1928. Bowl Stands At 7.75″ High x 9″ Diameter. Gorham Sterling Silver Revere Style Bowl. 11.50″ Diameter x 6″ High. Gorham Sterling Silver Paul Revere Reproduction Bowl1954 Height 6 1/8 inches, diameter 11 5/8 inches. Antique English, Sterling Silver, Round 2 Handled Bowl. Made By Henry Stratford, Dated 1903. The Part Fluted Body Is Centered On Each Side With A Blank Cartouche, Set Into A Cross Hatched Shaped Panel. The Lion Masks On Either Side Have Swing D Shaped Handles. Bowl Has A Dimension Of 11.25″, Height Of 7.25″ And A Maximum Width Of 12.25″. The Pedestal Foot Is 7.25″ Diameter. Great Presentation Item With Room To Engrave On Either Cartouche And The Blank Strips Above & Below The Fluting. A Decorative Fruit, Flower Or Ice Bowl, Or As A Wine Cooler For 2 Of 3 Bottles. Custom made, sterling silver gilt, oval centrepiece or tureen, made with removable parts so that it can be used for a multitude of uses. Soup tureen, centrepiece, wine or champagne cooler, punch bowl, jardinière, fruit bowl etc. Handmade, in London, England in a George I style, by Tiffany & Co, dated 1984. The lid & collar detach, and you can use the metal wirework insert for flowers, or without the insert as a fruit bowl, cooler or centerpiece. It can also be used with the collar only, as a slightly taller centerpiece or jardinière. And then complete with the lid, it can be used as a soup tureen or just as a decorative centerpiece. Exceptional quality and condition. Cast shell and gadroon shaped border, applied shells on stippled body, cast foot, handles and finial. With a good quality heavy gilding, in and out. All parts are sterling silver, except the wirework insert, and all the parts are hallmarked. A decorative, large round hand made sterling silver bowl, hand chased with foliage, deer, pheasants & female head decoration. The large applied, cast handles are formed as crowned female heads, and the foot has applied cast female heads to match those on the body. The bowl stands 10.5″ high, with a diameter of 12.75″. The width over the handles is 15.5″. Marked on the foot. Great centerpiece bowl for flowers, fruit, or even as a wine cooler. 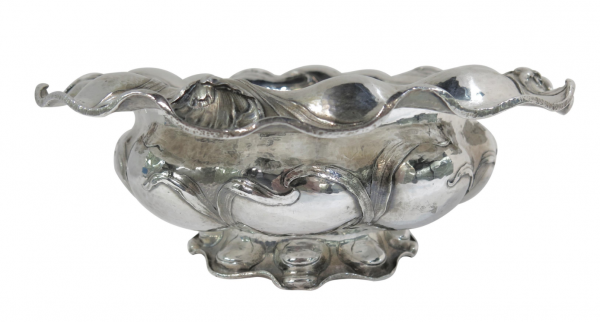 Large Art Nouveau Style, Antique Sterling Silver Bowl, Made By Black, Starr & Frost, Circa 1900. The Bowl Is Decorated With A Hand Chased Floral Decoration On The Body, With An Applied Floral Border On Top Rim, Matching The Applied Decoration On The Foot. Bowl is 13″ Diameter x 8 3/4″ High. Large & Highly Decorative, Antique Victorian, Sterling Silver, Centerpiece Made By Horace Woodward & Co, London 1894. The embossed plateau of bold scrolling shell and foliate ground around two central cartouches, one engraved with presentation inscription, supporting three detachable oval baskets; one large and two small, embossed in a similar manner to the plateau around the Cork city arms. The presentation was to Mayor Augustine Roche for his service of 1893 & 1894. The Cork coat of arms showing a ship between two towers, with the Motto of Cork City: ‘Statio Bene Fide Carinis’ These Latin words mean a ‘safe harbour for ships’. The firm of Horace Woodward was originally established in Birmingham c. 1850 by George Cartwright and Joseph Hirons, trading as Cartwright & Hirons. In 1853, when Horace Woodward entered in the partnership, the firm changed to Cartwright, Hirons & Woodward. The firm was active as silversmiths at 138/139 Great Charles Street, Birmingham, and London showrooms at 41 Hatton Garden, London. In 1859 Joseph Hirons left the partnership and the firm changed its name to Cartwright & Woodward. In 1865, after George Cartwright’s retirement, the business was continued by Horace Woodward under the name Horace Woodward & Co. In 1883 Horace Woodward left the company and the business was continued by Edgar Finley and Hugh Taylor, maintaining the same name until 1893 when the firm was converted into a limited liability company as Horace Woodward & Co Ltd. In the same year the production was transferred to Atlas Works, Paradise Street, Birmingham and additional premised were opened in 1903 at Vyse Street, Birmingham. In 1919 the firm was acquired by Adie Brothers Ltd. The firm participated with great success in the London Exhibitions of 1851 & 1862, Paris Exhibition of 1867 and Melbourne Exhibition of 1881. Victorian, sterling silver, round, hand chased, footed bowl. Made By William Gibson & John Langman of The Goldsmiths & Silversmiths Co. 112 Regent Street London. The bowl beautifully hand chased on body and pedestal foot with floral decoration. The body with two blank cartouches Measures: 11.5″ diameter x 7.25″ high Hallmarked, London, 1896. English hallmarked, sterling silver bowl with applied Celtic (sometimes referred to as a Lindisfarne) designed rims on top and base of bowl. Made by Wakely & Wheeler. Hallmark For London 1934 with the special silver Jubilee Hallmark. The bowl measures 12.25″ diameter at the top, and the foot 7.25″diameter. Bowl is 6.25″ high. An exceptional quality bowl. Very distinctive and practical, for fruit, roses, food, ice, bottles etc. Also would make an impressive presentation piece. Antique French silver jardiniere / oval centerpiece. Made in Paris, circa 1890s. It is the higher standard of 950 silver, as opposed to the sterling standard of 925. The centerpiece has the original silver plated insert. Measures: 16″ x 9″ x 5″ high. Makers Mark Of T. F.
An Exceptional Quality, Rare & Massive, Sterling Silver Warwick Vase Wine Cooler. George III Dated 1818, Made By Solomon Royes & John East Dix In London, England. The Detail Is Exceptional, Probably The Best You Could Find, And One Of The Earliest & Largest Examples In Sterling Silver. The Original Warwick Vase, An Ancient Roman Marble Vase With Bacchic Ornament, Was Discovered In Pieces, Near Rome At Hadrian’s Villa At Tivoli About 1771 by Gavin Hamilton, A Scottish Painter, Antiquarian And Art Dealer. He Sold The Fragments To Sir William Hamilton, British Envoy At The Court Of Naples, Who Had It Repaired & Restored. It Then Passed To His Nephew George Greville, 2nd Earl of Warwick, Who Brought It Back To Warwick Castle Where It Caused A Sensation. At First It Sat On The Lawn At The Castle, But Later Was Moved Into A Greenhouse To Preserve It From The Weather. The Vase Was Widely Admired And Much Visited In The Earl’s Greenhouse, But He Permitted No Copies To Be Made, Until 1808, When Molds Were Made At The Special Request Of Lord Lonsdale, Who Intended To Have A Full Size Replica Cast In Silver. The Sculptor William Theed The Elder, Who Was Working For The Royal Silversmiths Rundell, Bridge & Rundell, Was Put In Charge Of The Arrangements, But Lord Lonsdale Changed His Mind, And The Project Was Aborted. The Rich Ornament, And The Form, Which Is Echoed In Sixteenth Century Mannerist Vases, Combined To Give The Warwick Vase Great Appeal To The Nineteenth Century Eye: Numerous Examples In Silver And Bronze Were Made, And Porcelain Versions By Rockingham and Worcester. Theed’s Moulds Were Sent To Paris, Where Two Full Size Bronze Replicas Were Cast, One Now In Windsor Castle, The Other In The Fitzwilliam Museum, Cambridge. It Was Also The Model For The Silver Gilt Tennis Trophy, The Norman Brookes Challenge Cup Won At The Australian Open. The Vase Has Two Large Handles Formed Of Interwoven Vine Branches, From Which The Tendrils, Leaves, And Clustering Grapes Spread Around The Upper Margin And Features Classical Bacchanal Masks And Associated Emblems, Such As A Pine Cone Tip Staff Known As A Thyrsus. Enfolding The Middle Of The Body Is The Skin Of A Panther, With Head And Claws. Above Are Heads, All Representing Satyrs, Except One, Which Is That Of A Female, Traditionally Said To Have Been Substituted For A Missing Head And Made By An Italian Carver In The 18th century Into The Likeness Of Lady Hamilton; However, As The Result Of A Supposed Quarrel With Her, The Carver Gave Lady Hamilton’s Head A Fawn’s Ear. The Vase Stands On A Square Pedestal Foot. A Truly Remarkable Item Of Historical Interest As Well As Being Decorative & Usable. This Is Just Another Example Of Investment Quality Items Available From Our Collection Of Silver DIMENSIONS 15.25 in.Hx22 in.Wx16 in.D 39 cmHx56 cmWx41 cmD Weighs Approx. 425 Troy Oz = 13,220 Grams, Well Over 29 Pounds. Antique English, Sterling Silver, Large Round 2 Handled Bowl With Hand-Chased Decoration Including Fluting & Embossed Flowers & Scrolling Acanthus, Each Side With Central Blank Cartouches. Bowl Stands On A Hand Chased, Round, Pedestal Foot. Made By John & William Deakin. Hallmarked 1905. Great Size, Quality & Maker. Decorative & Useable For Punch, Fruit, Flowers, Or Just As A Decorative Centerpiece. Diameter 14.5″. Width Over Handles 22″. Height 13.25″. Weighs 4,370 grams.